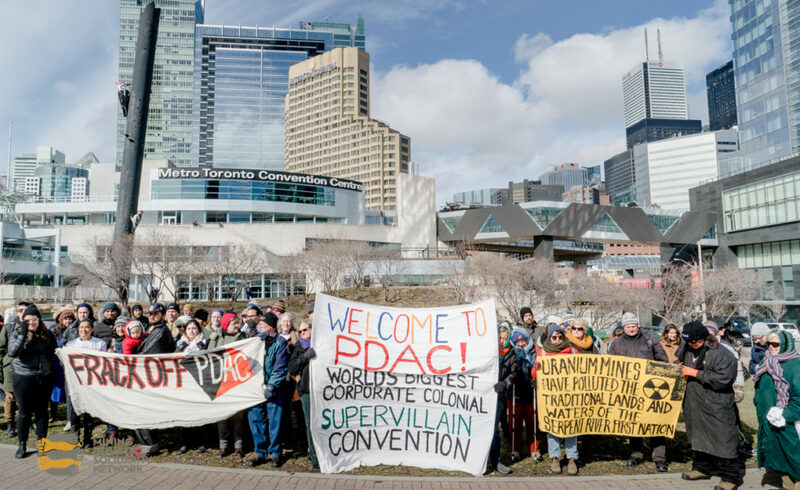 PDAC: it’s been called the Superbowl or the Oscars of the resource extraction industry. Every year, the Prospectors and Developers Association of Canada (PDAC) convention comes to Toronto, claiming to promote responsible mining, facilitating relationships between companies and investors, and promoting pro-mining curriculum aimed at children and Indigenous communities. And every year we’re there, not letting them get away with the facade. Try to come with a friend or in a group — if you don’t have someone to come with and want us to connect you with a group, please let us know in advance! Stop by Hoops Sports Bar & Grill (125 Bremner Blvd) any time between 1 and 4pm to obtain the instructions for your adventure — we’ll be set up at an easy-to-identify table! The treasure hunt can take as little as an hour, but feel free to stay for as long as you want! Once you’ve finished the treasure hunt, check back in with us at Hoops to tell us how it went and to retrieve your “liquid gold” prize (available only to people who RSVP in advance). Special “liquid gold” prizes available to those who RSVP for the treasure hunt in advance. Speed up the process of beginning the treasure hunt by pre-registering yourself for PDAC here (click “Register Now” and select the ‘Investors and Select Presentations Pass’, which is $0). Our “liquid gold” prizes provided graciously by local Ontario bees (and harvested by Turnview Farm Honey)! The entrance of Hoops (the starting point) is wheelchair accessible, and we will do our best to situate ourselves in a section of the restaurant that is accessible as well. On the off chance that this is impossible, just let the restaurant host that you’re here for the MISN folks and we’ll come meet you where you are to give you your instructions. The washrooms are not accessible, but you’ll be spending the majority of the treasure hunt elsewhere! Let us know (at least a week in advance for interpreter requests) if there’s anything else we can do to make this event accessible for you (e.g. arranging for an ASL interpreters, sending you materials electronically, etc.). We’ll make sure there are large-print copies of all materials available.